To exceed our customers expectations in professionalism and quality workmanship with the use of products that have been proven through trial, adhere to our standards, and are worthy of elevators that bear our name. We hope you don't forget NCIS after we've completed the job, because it's our intention to never be called back to your property and unnecessarily inconvenience you by having to rework an install that should have been done right the first time. We offer re-cladding services to make any or all of your sheet metal surfaces new again. If your property has a budget restriction we also offer refinishing options that will restore your sheet metal to it's original bright finish. Deep scratches and dings however, will remain. For options that offer greater durability in high traffic applications, check out some of our suppliers' products below. Your wall finishes are our command. We have suppliers for every surface an architect can dream of applying. From everyday laminates like Wilsonart and Formica, to exotic solid surfaces from Corian, stainless meshes and weaves from Banker, and composite, glass, or mirror finished colored metals from Forms and Surfaces. It seems there are new products for interiors finishes of buildings emerging daily. 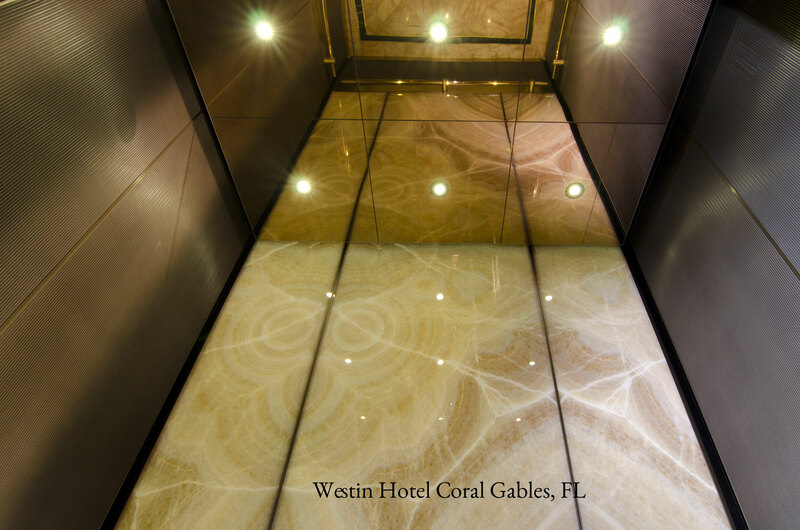 Whether it's opaque wire mesh, ultra modern composite panels, or elegant solid surface products, we can make your elevator the center of attention in a swank and luxuriously appointed property. The selection of flooring products is easily as mind boggling as the choices available for wall finishes. Products most highly recommended by us come from American Biltrite. The product lines we most commonly deploy are their Marathon and Sonata lines. American Biltrite enjoys large presence in the commercial flooring industry due in part to the quality of their product, and also to their attention to building code compliance, product testing, and documentation regimen. Avion is another flooring company we install. Avion manufactures luxury sheet vinyl products that are famously durable and maintenance free. All products are installed on either proprietary or premium pressure sensitive adhesives that provide a secure bond, yet allow for removal of damaged tiles and a reinstallation of a replacement tile that takes minutes rather than using epoxy products that require an overnight curing period to set up. Who wants their elevator to be down overnight?